The Nigerian Army has recorded another success in its effort to curb pipeline vandalism by the notorious Niger Delta Militants as it has arrested some of its members. It is going to be a tough time for members of the Niger Delta Avengers as the Army haas successfully captured some members of the group. The group became notorious for blowing up oil installations and pipelines in the Niger Delta. 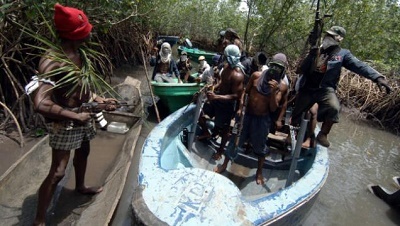 “This is to confirm the arrest of some suspected members of Niger Delta Avengers,” in connection with attacks on Chevron oil facilities, military spokesman Rabe Abubakar said. Abubakar reveals that the “military will continue to do its best to safeguard strategic facilities and provide security to lives and property” but did not mention how many members of the group were apprehended. The attack by the militant group has led to a reduced output by the Nigerian National Petroleum Corporation and cut in power across the nation.